Feb 16, 2017 at 12:28 AM | 191 Views | Last edit Aug 18, 2017 at 08:28 PM 5 rev. I am trying to install\Configure the BI Platform Support Tool for our BO 4.2 SP3 Production system running on windows OS. I followed all the steps listed in the SAP BI Platform Support Tool Wiki to install/configure the SAP HostAgent & JMX Configuration for Apache Tomcat. 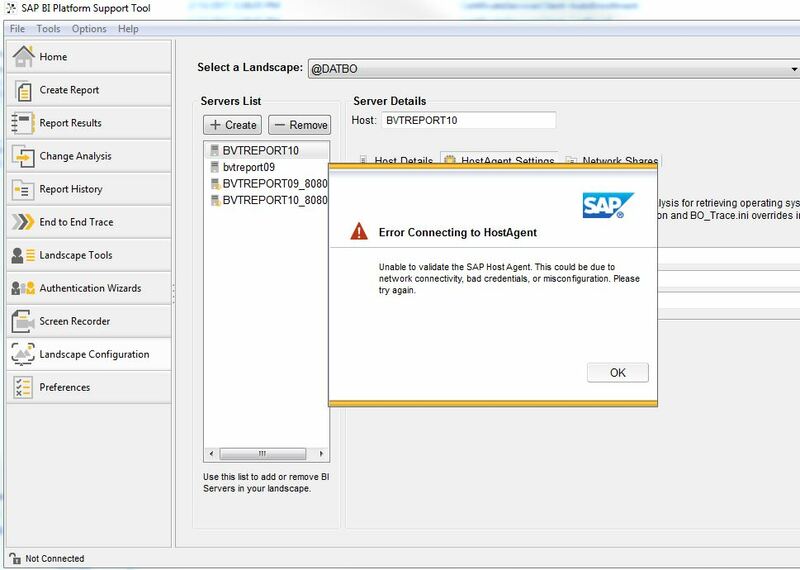 When I am trying to validate the SAP Host Agent Connection from Client Tool,I am getting connection error. I verified that SAP HostAgent services are running and no errors are noticed in Tomcat logs post implementation of JMX changes in Tomcat. Please refer to attached screenshot for details BIPST Client Side SAP HostAgent Error message. Sorry for the long delay. Can you try putting the wsdl URL into a browser on the BI Platform Support Tool client and see if you can connect this way? This will confirm the BIPST client can connect to the server on port 1128. It could be an issue that this port is blocked to the server. Let me know if you still face an issue on this.